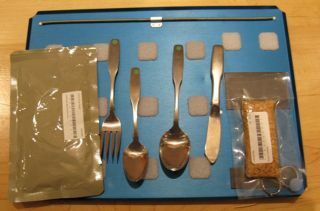 A metal food tray with magnetized silverware and Velcro patches to secure food packets (at left and right) in the microgravity environment. NEWYORK — Roastedchicken in a sweet ‘n' sour sauce, washed down by a mango-peachsmoothie.Sounds like food fit for … an astronaut? Whenmost of usthink of space food, we think of unappetizing, chalk-like chunks offreeze-driedice cream, food that comes in tubes in the manner of toothpaste and, ofcourse,Tang. Yetflavorful chickenand (real) fruit drinks have indeed been served in space — albeit inrehydratedform. Atasteof space food landed here at the American Museum of NaturalHistory lastweek to give dining connoisseurs a flavor of what astronauts consume inspace. Although prepared fresh by a caterer — instead of rehydrated— the food choicesshowed how far eating in space has come over the last 50 years. Ondisplaybuffet-style were shrink-wrapped packets of food, from creamed spinachtoM&M-esque candies, which astronauts and cosmonauts gobbleduring theirstays in space. Bourlandworked for30 years at NASA's Johnson Space Center as a space food guru. Hedeveloped boththe meals and the methods of eating them for astronauts flying in theApolloprogram, on the space shuttle, and living for extended periods inSkylab andthe International Space Station. Overthe decades,he has seen space dining evolve from having foodin a squeezetube — and astronauts going hungry — to shuttle crews nowpersonallyselecting their meals months in advance of a flight and enjoying itemssuch as(rehydrated) shrimp cocktail. That'sa far cryfrom the initial glum outlook of some scientists when the humanspaceflight programgot under way nearly 50 years ago. "Somethoughtthat astronauts might not be able to eat in zero gravity, that theywouldn't beable to swallow," Bourland said. "Apparently they didn't watchcollege kids drink a beer on their heads — you can swallow upside-down." Toprove the point,upon arrival at the museum eventgoers were treated to a cup of Tang.Thissweet, orange-colored, powdered drink became famous for its adoption bythespace program in the 1960s and it is still gulped high above our planettoday. Inthis environment,liquids glob into airborne amoeba-like droplets and water boilsweirdly. Insteadof hundreds of roiling, rising bubbles, one big, blobby bubble formsthat drawsin smaller air pockets. Meanwhile,minor,earthly annoyances such as bread crumbs can become a health hazard byirritating the airways of astronauts if inhaled. Despitetheseobstacles, NASA's culinary goal has been to provide astronauts withnourishingyet recognizable meals, rather than just sustaining the crew on proteinpellets, vitamin pills and other tasteless rations. Tothis end,dieticians and cooks for NASA have come up with meals that aim togustatorilystimulate and psychologically satisfy, Bourland and Vogt explained. Forsweet ‘n' sourchicken, NASA freeze-dries the boned, skinless chicken chunks aftertraditionalpreparation in a terrestrial kitchen, and the sauce goes into space asa drymix with instant starch that is then rehydrated. Atthe Oct. 27museum food tasting, eventgoers sampled a fruity slurry of themango-peachsmoothie poured into cups from a pitcher, while astronauts would takethe drink— or any other liquid — from the shuttle beverage package. Thisis a specialcontainer that holds powder and then connects to a galley waterdispenser forrehydration. It has a straw for careful drinking and that avoidsleakage fromthe container. Anothertastyoffering at the event was garbanzo bean burgers. Althoughthese havenot been eaten in space — yet — Bourland explained that these veggiepatties havebeen pegged as the sort of food that long-distance voyagers to Marscouldprepare from beans grown in their spacecraft. Thebean burgers andsome other foods included in "TheAstronaut's Cookbook" were concocted by people involved inthe spaceprogram. Celebrity chefs Emeril Lagasse and Rachael Ray alsocontributedrecipes to the book. Forexample, thefinal item offered at AMNH — lemon bars — came from a recipe by PaulaHall, aformer shuttle and ISS dietician who died in 2007. Preserving orreplicatingthe tart's pleasing gooeyness in orbit might well be tricky, Bourlandsaid. Spacestationresidents take their meals on a metal tray, as shown at AMNH, withstraps onthe bottom to attach to their laps. Velcropatches onthe tray and food packets keep the grub anchored. Astronautsuseregular utensils — fork, knife, spoon — though they are magnetic toattach tothe tray, and there is one more crucial implement: a scissor to open upfoodpackets," said Vogt, who has worked for NASA as an educationspecialist. Asfar asastro-food has come – the book authors showed a slide of early, soapbar-like"chicken sandwiches" that astronaut's saliva was in theory supposedto rehydrate to become palatable — it still has a long way to go. Althoughthe titleof the book is "The Astronaut's Cookbook," nothing, Bourland pointedout,has ever been cooked during a manned spaceflight mission. "We haven’tcooked in space," he said, "we've just warmed up food to eatingtemperatures." Grilling,boiling,roasting, saut?ing — all these require significant heat, which can poseathreat to both the crew and the space-faring vessel itself. Plus,"if youburn a steak, you can't open a window to let the smoke out," Bourlandsaid.